IVF Twins 5 Weeks 6 Days - Teeny & Tiny! We are so excited to be having twins we have been very fortunate to have done IVF twice and both times gotten pregnant first time. 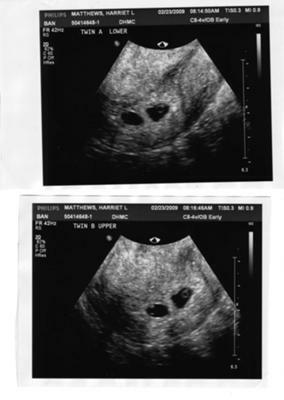 Two little beans with two little heartbeats!! Comments for IVF Twins 5 Weeks 6 Days - Teeny & Tiny! I'm 6 weeks and 2 days preg. I had 2 d5et. I find out tomorrow if it's one or two. I'm HUGE though. Thinking it could be 2. I'm due Dec. 18, if it's one. Sounds like I have something in common with "Anonymous" (I think). Good luck to everyone! I appreciate your posts. They're helpful and encouraging! Thanks for all your comments, I have not checked back here for a while!! Well we are 15 weeks this week and the babes are growing FAST!! Hey Kimmmy, this is our second IVF attempt that worked first time. We had two embryos transferred the first time and 9 months later we had our beautiful daughter Grace! We had 2 transferred this time and got two little ones due on October 21. It is a hard time waiting for your transfer and your results, but I guess you will have had your transfer by now. How did it go? Lee, how is it going? Are you starting to feel nausea yet? Congratulations on the two!! My email address is harrietlmatthews (at) yahoo.com, feel free to email me directly!! Love the pictures. I am 39 and also pregnant with ivf twins. I am due Dec 10, 2009. So scared things will go wrong still. Have second ultrasound in a week. my name is Kimmy! I am doing my embryo transfer this month. just curious how many embryos they transfered for your twins? I just turned 30 and I will be putting maximum 3 in end of this month. Really nervous because ....well, could be twins or triplets. Nice to chat here with this site I stumbled across. Looking for stuff to do while I am on bed rest for my transfer. It was with great pleasure to see you ultrasound. I am also pregnant after my 2 attemp at IVF and we are also having twins. I have looked at all the belly galleries and other ultra sound pictures but non have been quite the same as mine, until yours. Your baby pictures look very similar to mine and are .31cm and .26cm. I am currently 7 weeks, but when my ultrasound was taken I was also 5w6days. My Dr is really down to earth and told me not to tell too many people yet, as she wants to see us next week (8wks) for a second scan....But we saw to hearts beating and I am a sick as a miserable dog. One wants to be so hopeful, yet there are still other tests that we have to leap over...I am 40ys and I have 2 older children..19 and 16 and have had no complications or miscarriages, so I pray that this is God's will and they will be perfect.